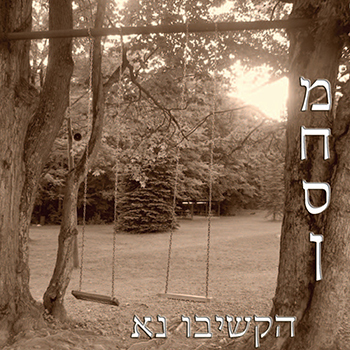 Camp Stone is an Orthodox Jewish summer camp located on 500 acres in Sugar Grove, Pennsylvania. It is affiliated with Bnei Akiva, the largest religious Zionist youth movement in the world. It was founded by Irving I. Stone, of blessed memory, in 1969, and it became a Bnei Akiva Moshava in 1972. Camp Stone is a four week program for children entering 4th Grade – 9th Grade. Each session explores a different time period in Jewish History, and an educational curriculum surrounding that time period is woven into the fabric of camp in a variety of different ways. 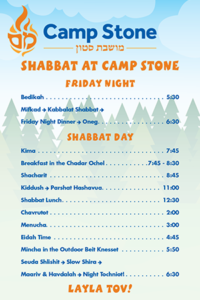 Below is a list of activities at camp as well as both the daily schedule and the Shabbat schedule. blacksmithing, glassblowing, woodshop, and much more! Kaytana is a two week immersion program for children entering 3rd Grade and 4th Grade. It has a maximum capacity of 15 girls and 15 boys, and a staff of 10 counselors for those 30 children. 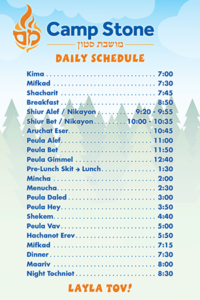 The program functions independently from the rest of camp, however, Kaytana campers participate in all the activities available at camp and are fully integrated with the rest of camp on Shabbat. PLEASE NOTE: Kaytana may not be attended twice. Therefore, if a camper elects to attend Kaytana going into 3rd Grade, then that child must go to the full 4 week program the following year. Machal is our graduating program for children entering 10th Grade. They spend Shabbat in camp, but during the week they are out of camp doing a variety of activities. At its core, Machal is an outward bound program where campers have the opportunity to hike in the Allegheny National Forest, canoe and portage in Algonquin Provincial Park in Ontario, Canada, and, in the final week, learn about the growth and decline of Jewish communities in Pennsylvania as they travel to Washington D.C. This final week includes a trip to Hershey Park and SkyZone as well as intense educational programming about community development. The overall objective of the program is to build a community within Machal by challenging the campers to push themselves physically and cognitively. It is a major step campers take towards developing leadership skills and independence necessary for returning as staff two years later. To learn more about any of these programs and better understand if Camp Stone is the right fit for your child, you may attend one of the many open houses held across the country each fall, or simply contact the Directors, Yakov & Estee Fleischmann. They would be happy to set up a time to speak with you. Downloads are free. Donations accepted.